Peel and halve the apples then core them. Cut them into medium-sized cubes. 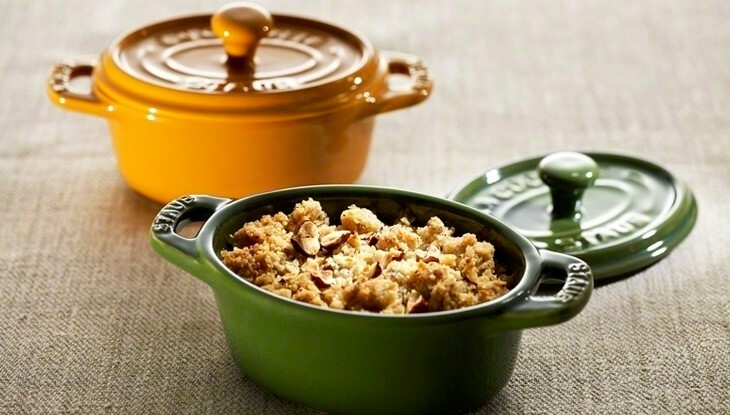 In a cast-iron cocotte or a saucepan, cook the apples with the butter, then add the sugar and vanilla. Stir regularly over a medium heat until they are tender and lightly caramelized. Then add the pears and (if they are ripe and juicy, add them only at the end so they don’t become mushy). In a bowl, mix the flour, ground hazelnuts, sugar and butter cut into small dice. 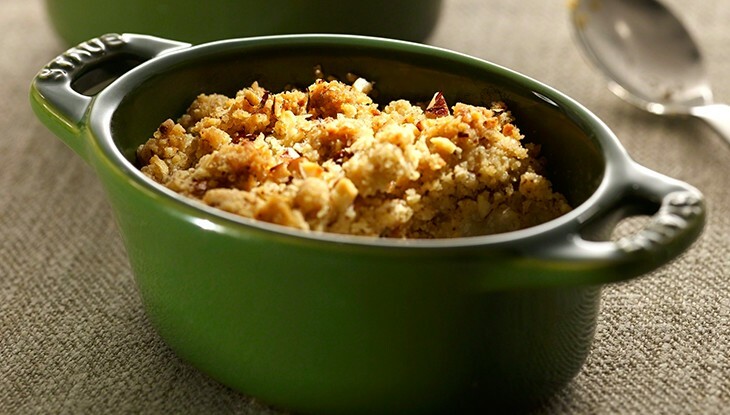 Mix the ingredients together with your hands till you get a crumble mix that resembles fine breadcrumbs and small pieces. Avoid kneading the mixture. The opposite, in fact. Pre-heat the oven to 180°C. Grease all the mini-cocottes. Start by arranging the apples and pears, then add the crumble mix, and finally the hazelnuts, which have been chopped by hand. should be golden and crunchy.